I am from Pennsylvania, but have lived in Singapore for seven months. Two nights ago, I just happened to look at my phone to see what time it was (4am) and saw a NY Times push notification about the Newtown killings. Needless to say I did not go back to sleep. 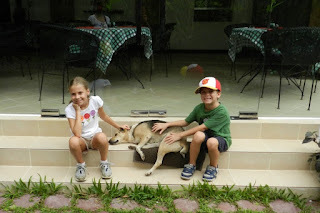 My blog has only been used thus far to share our family thoughts about our experiences here and our travels abroad, but I just can't keep silent. Yes, people kill people. But I would like to think that I have common sense, and I know that you can't walk into a classroom of kindergartners and kill them ALL in about a minute unless you have a weapon that NO ONE REALLY NEEDS for any reason. Don't tell me that a knife-wielding man attacked a class in China. The kids are not dead. Evil is evil, but some ways are easier than others to end life. Do I support the right to bear arms? Yes I do. But I don't think that our forefathers envisioned the type of weapons that are currently accessible to the masses. As someone wrote on Facebook, "Are the British coming to steal your McMansion?" Why are so many people intent on thinking that we cannot interpret an amendment? I guess we should bring back slavery, or disallow women from voting. What happened to common sense? I know, I know, I KNOW. People will tell me on Facebook all day long that criminals don't care about the laws. But this argument doesn't really apply to this category. Most mass murderers have easy access to these types of weapons. If you are really so scared about someone threatening your home, do you NEED a weapon that can take out a room of kids in a minute? Has there been any instances reported of someone that successfully fought off an attacker, or group of attackers, in their home because they owned an assault rifle? Where does it end? If the US is in a position to prevent entire countries from choosing what weapons they are allowed to have, what makes you think you have the right to own something that is solely manufactured to take away human life as quickly as possible? But that is certainly not the only problem. Where are family values? And no, I'm not talking about religion. I don't go to church. I have beliefs, but I don't think you need to go to a building each Sunday to prove it (that is not an insult to churchgoers, it's just not for me). But what I do have is a good understanding of family, of keeping my kids close to me and making sure that I know what is going on in their lives. Do things go undetected in families? Of course they do. My family is not perfect. But how many times can we read..."he was a nice, quiet boy". Seriously? It got THAT FAR and no one noticed anything? Or if they did, no one did anything? If these people were my family or friends I would not ignore it. Do me a favor - keep your friends and family close, and pay attention to their well-being! There is no magic answer. But what if, JUST WHAT IF, we were able to realize that a multi-pronged approach was possible. We could look to our government to enact certain changes that could make it more difficult to massacre a classroom of children, and look within ourselves to raise better people, or at least to get help to the people who really need it. The people of the United States have to truly look within themselves, and also challenge the lawmakers, to prevent something like this from happening again. There is hope. For those complaining that anyone who speaks out is "politicizing the tragedy", I respectfully disagree. The best time to talk about things is when it is being thought about the most. Change happens when people care. And everyone cares about those kids and adults. And their families, friends, first responders...all of them. We are not doing a disservice to their memory by trying to enact change. God bless those families. I admit I dusted off a lot of prayers this week. The alarm sounding off at 6:30 am was significantly more annoying than it was just 24 hours before. After a second full day of sightseeing, we were exhausted and reluctant to get out of bed - but we knew a very interesting day lay before us. Rhat and our breakfast orders were waiting for us when we finally emerged from the room. All you loyal readers by now know that Tuna was also awaiting us! 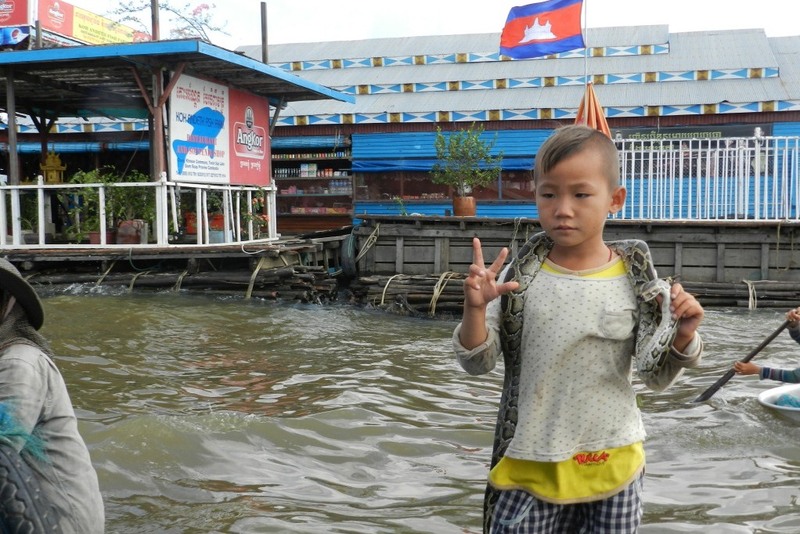 After breakfast, we put our tourist hats back on and met Savonn in the hotel driveway for our drive to Tonle Sap, the famed floating village. 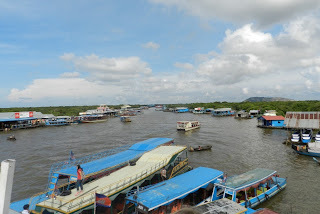 Tonle Sap is the largest freshwater lake in Southeast Asia, ranging in size from about 3,000 square km in the dry season to upwards of 15,000 square km during the monsoon season, when water from the Mekong river is pushed into the lake. 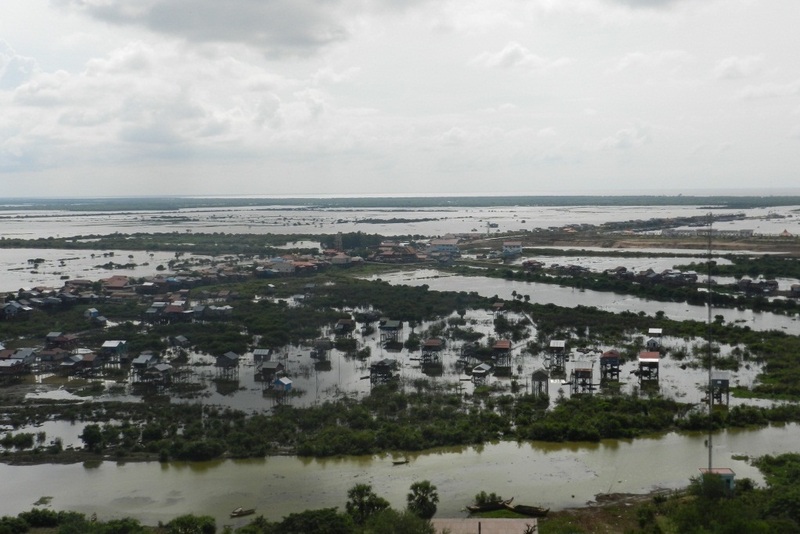 In the dry season, Tonle Sap averages about four feet deep, but in monsoon season it can get as deep as 30 feet, flooding fields and forests in all directions. Our visit in November was toward the beginning of the dry season and the water level in the lake and surrounding fields was relatively low...but from the look of things, you wouldn't necessarily know it. 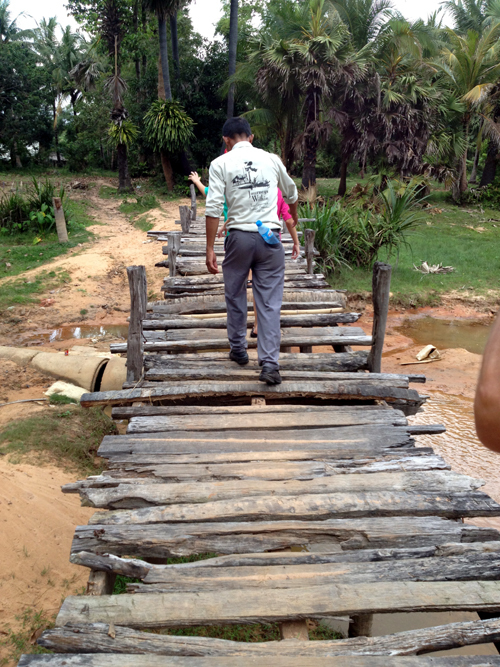 The drive from Siem Reap took us through several villages and along small rivers where houses are clearly built to avoid flooding. When I say, "built to avoid flooding", I mean they are built several feet above the water on tiny stilts that appear hardly capable of bearing the weight of the structure. Upon reaching the lake, we noticed in-process construction on a large luxury resort overlooking the docks. The modern engineering and sturdy materials of the resort were in stark contrast to the primitive, fragile wood and metal framed homes that sit along the lake's edge only a few hundred yards away. Many of the homes are 25- 35 feet above the current water level, perched on bamboo, wood and in very few places, concrete stilts. Most had loose wood planks, balanced unevenly, from the front door to the roadway nearby. Apparently a fear of heights and poor balance have been eliminated from the population that live there. 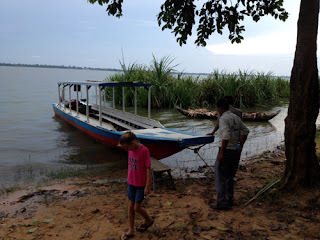 Once at the lake, Savonn escorted us through a small "boat terminal" and directly to a waiting boat and captain who would take us for a tour. The boat could have handled about ten passengers, but we pushed off from the dock with only the five of us and the captain on board. The water was a murky, "coffee with 2 cream", brown and relatively calm for such a large body of water. Shortly after leaving the dock, a small boat sped towards us. Like a Somali pirate, but far less dangerous, the smaller and faster boat caught up to us and a young girl deftly stepped from the moving boat onto the back of ours and peddled snacks and drinks. 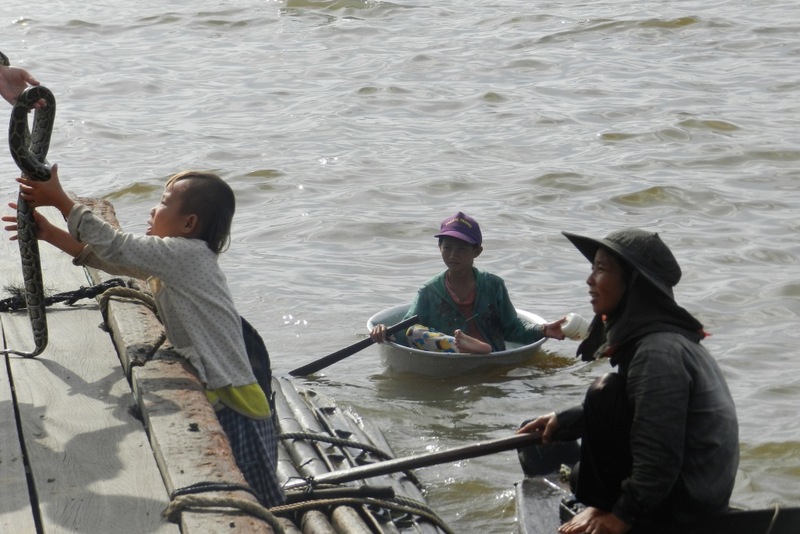 After we refused, she quickly stepped back onto the smaller boat, where her father waited, and the two shot off in another direction toward a boat full of tourists. So many places we visited we were approached by children selling things. As difficult as it was to refuse, it is important to in most cases. 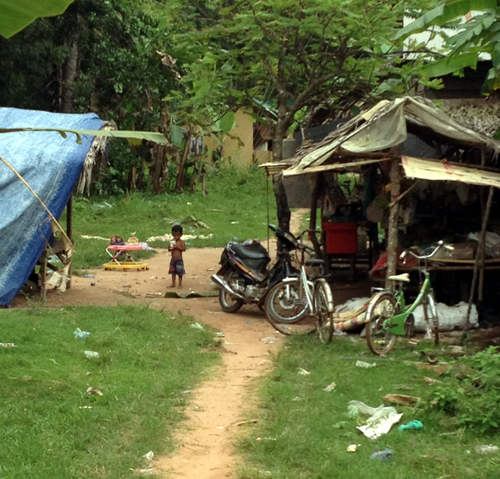 Many of these children are forced, some by non-family members, to make a living like this. Much of the money they receive doesn't even go to them. It is a sad, sad situation, and trust me, very difficult to turn your back on. A few minutes later, we approached one of the many floating villages on Tonle Sap. This particular village was home to approximately 500 residents, all of whom live in small, floating homes anchored to the bushes and trees that poke through the water's surface. 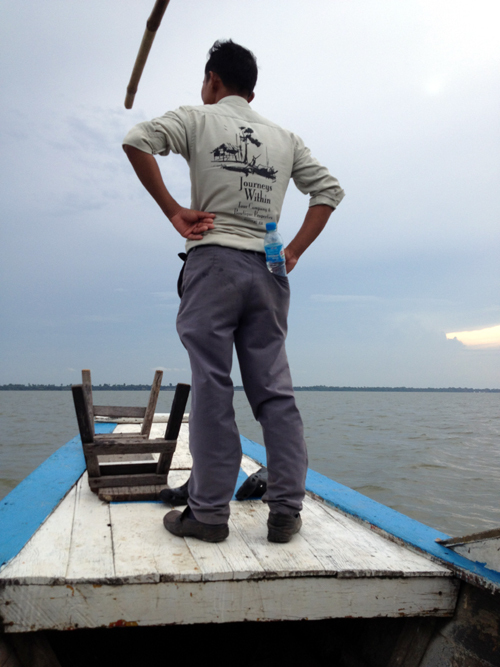 Most are fishermen, but as in any town, there are people making a living in other ways. For example the village had a floating school house, a floating Buddhist temple and there were several people going from boat house to boat house selling produce and other necessities. As our boat passed by these "homes", children could be seen playing on the hard wooden floor of the boats or rocking in hammocks that hung inside and outside the structures. Others bathed in the lake water, and we saw one boy just lean over and drink directly from the lake (not a good idea but this is how they live). There were several boats where men and women sat inside a netted structure, smacking small fish as they jumped all around them - we were told they were making fish paste. Other men had clearly just returned from fishing with large buckets full of the tiny fish (regular fishing season hadn't started yet - the law only allows fishing half the year to allow the fish to reproduce the other half). 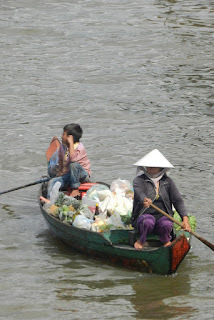 The women we saw were mostly tending to children, or rowing small boats around the lake full of supplies. As Savonn described it, the "rich" people have gas powered generators so they can power small TVs for short periods of time, while most others either run off of battery power or have no electricity at all. We saw very few TV's, but I was surprised to see a few families gathered around a laptop watching and laughing at something. 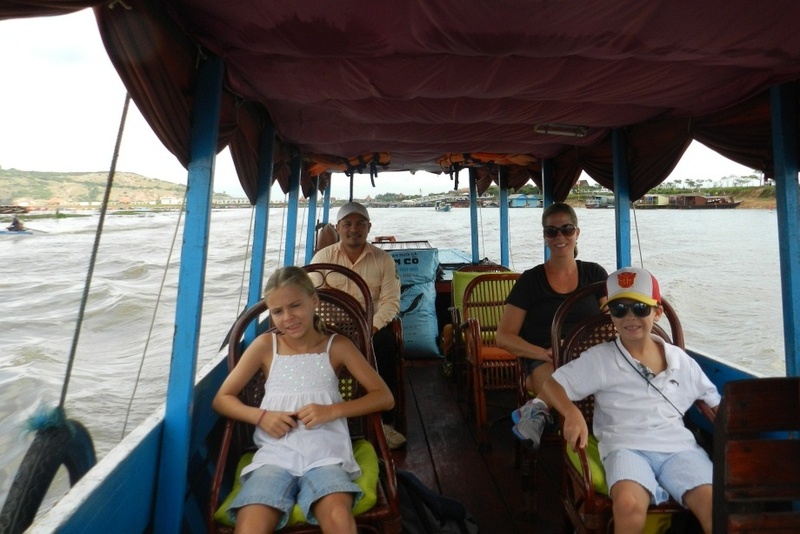 As we approached the floating restaurant and gift shop, several young children approached our boat - floating in what appeared to be large silver keg buckets. Around their necks or simply laying in the bottom of the bucket where the children sat, were large snakes that had been raised by the children and their families as a source of income. Take a photo - make a donation. One boy, pictured below, had a python 6+ feet in length around his neck. Jennifer immediately broke out in hives and slowly walked backward, almost falling off the side of the boat. Now THAT would have been an awesome end to this vacation! The other *crazy* part of the floating restaurant was the crocodile farm. Built under the boat with barriers was a pen holding probably 30-50 crocodiles caught in the river as babies and raised in captivity. We just stared down into the pen in complete awe of these creatures that looked like statues but who would gladly chomp us into pieces if we leaned just a litle too far over the railing. The entire scene was very surreal, and more than once Jennifer and I looked at each other incredulously and speculated as to how we got here. The people were all very friendly, seemingly not concerned about yet another group of tourists gawking at their homes and their way of life, but it seemed impossible to believe people still live this way. Eventually, we made our way back to the boat dock, which now seemed far more civilized than just an hour before. During the entire boat ride back, and upon reaching the dock, I couldn't help but notice just how many people were taking pictures of us, and especially the kids. We were the unwitting subject of the stereotypical Asian tourist. It was obvious that Caucasian children, in particular, are a rare sight. Sophia and Cooper's blonde hair and blue eyes surely were interesting to so many of the people we saw along the way. 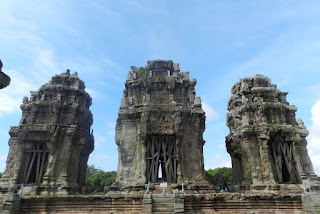 Revived by the cold aircon in the car, we started toward the final stop of our adventure, Phnom Krom. 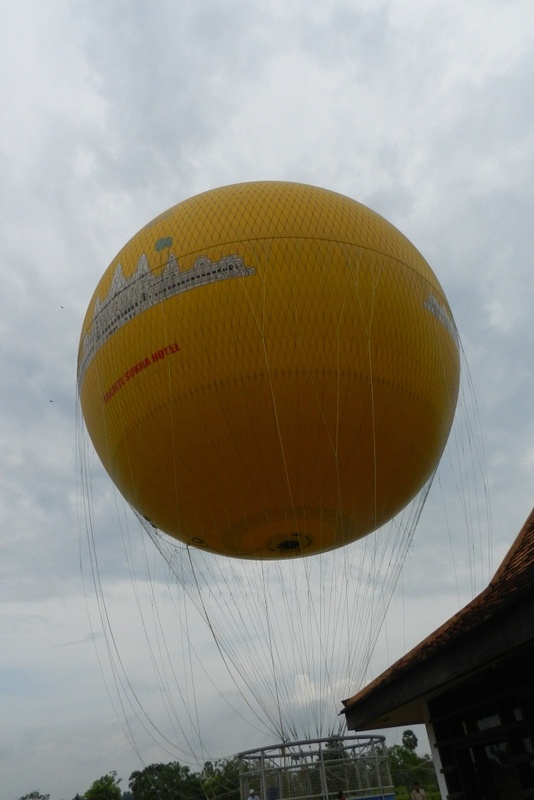 Phnom Krom is a 140 meter high hill a short distance from Tonle Sap. To get there, we climbed a few hundred steps and walked at least 1/2 mile up a steep winding road. Once at the top, we saw an amazing temple built in the 9th century to honor the Hindu deities of Shiva, Vishnu, and Brahma. The temple is far smaller then the others we had seen in Siem Reap, but the fact it was built on top of this hill, IN THE 9TH CENTURY was amazing. 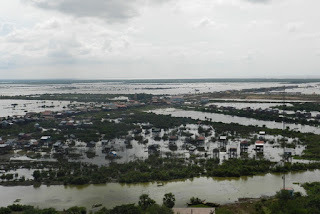 The view was spectacular as well, offering a view of Siem Reap from one vantage point - and a view over the small village and Tonle Sap lake from another. 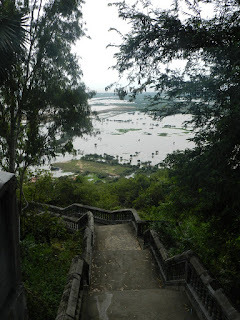 From here, the massive size of the lake was apparent, as was the unthinkable impact of the seasonal flooding. I found myself wondering why so many people choose to put themselves in potential danger by living in a flood zone when a perfectly good, dry hill was only a short distance away. Then I realized it was a stupid thought when 80% of the people who live there make a living fishing in the lake and the other 20% make their living related to something in or around the water. After climbing back down what must have been a thousand steps, we headed back toward Siem Reap for one last lunch with Savonn, a final stop at Journeys Within, and then the drive to the Siem Reap airport. 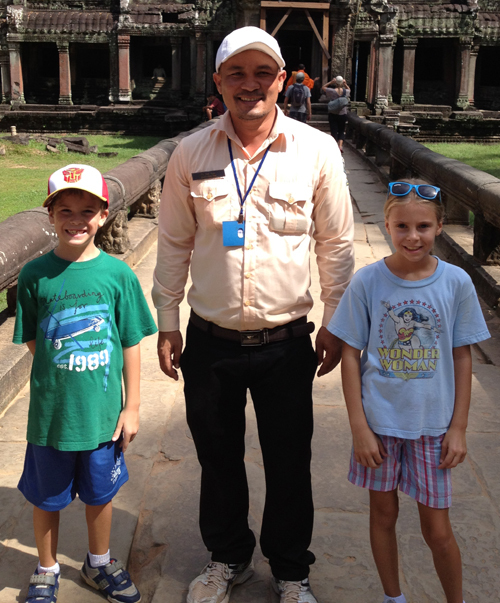 At lunch, Savonn shared more stories about his family and children, and we enjoyed a few more Angkor beers. Upon returning to Journeys Within, we said one last goodbye to Rhat, Alex, and other members of the JW staff...and of course Sophia and Cooper had a tearful goodbye with Tuna, the house dog. As we pulled out of the JW driveway, the staff members all stood waving, and did not stop until we were out of sight. Jennifer cried - OF COURSE. Savonn made the drive to the airport with us, and saw us off to the airport entrance. So after about 72 hours, 8 temples, 2 boat rides and countless Angkor beers, our visit to Cambodia came to an end. We said a final farewell to Savonn, promising to keep in touch via Facebook and offering to provide a review for him on TripAdvisor. We also made a note to send a supply of Frontline to Journeys Within to help Tuna stay healthy and avoid the Cambodian tics. Most importantly, on this Thanksgiving weekend, we made a promise to ourselves to remember the children and families of Tonle Sap and the other small villages of Cambodia, and to never forget just how fortunate we are to have been born in the United States. Day three, like day two, began with breakfast at JW. We were all a little more tired than the day before, but that's what 100 degree heat and ten miles of walking and stair climbing will do, when you're used to the comfort of Singapore's exceptionally convenient, air-conditioned public transportation system. 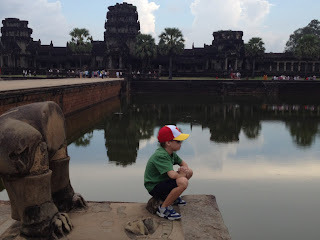 Nonetheless, we were all out of bed early and eager to explore more temples. Tuna, the resident dog, was waiting in her usual spot just outside the glass doors to the small restaurant. She barely moved when Jennifer and I stepped over her to go inside, and moved just enough to wag her tail as Sophia and Cooper greeted her. Perhaps she had a rough night on the town? 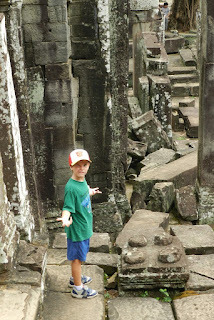 After breakfast, we met Savonn at the hotel's driveway and headed toward our first stop of the day, Angkor Thom. Angkor Thom was the last and most enduring capital city of the Khmer empire, built in the late twelfth century by King Jayavarman VII. 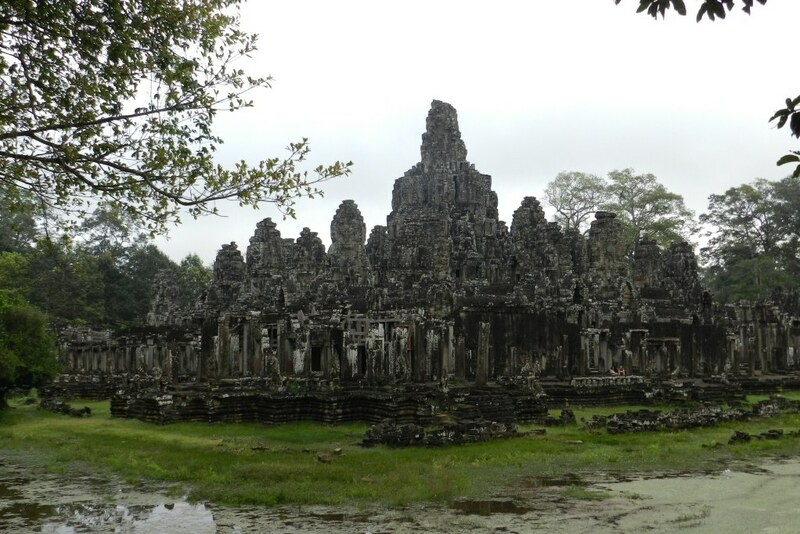 Like Angkor Wat, Angkor Thom is massive, covering an area of over 9 km². It is completely surrounded by a man-made moat and giant sandstone wall. 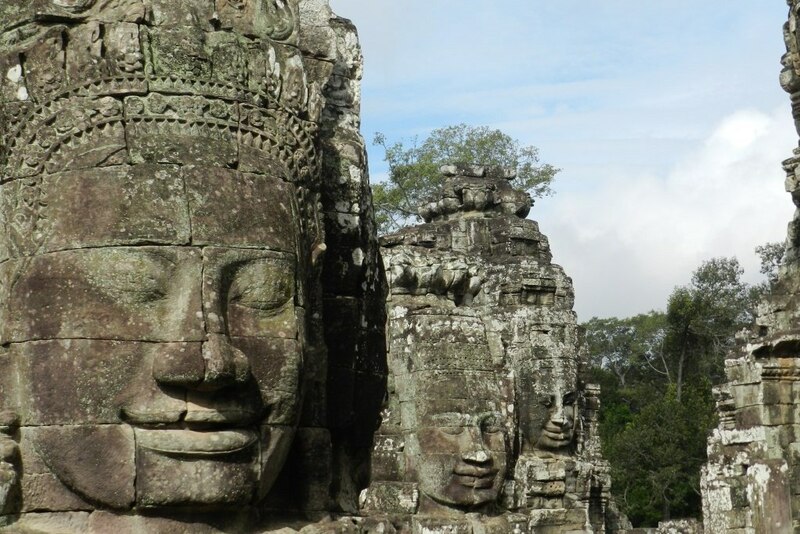 Within the wall surrounding this ancient Khmer city, there are several structures and multiple temples, at the exact center of which is the Bayon Temple. 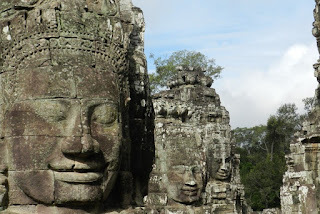 The Bayon Temple is one of the most recognizable in due to the enormous stone faces found on every tower of the temple. Savonn provided us with some history of the temple and we briefly viewed the structure from outside before walking a few steps away to meet a new friend, Sambo. temples in the mid 1860's. The ride was bumpy, but a lot of fun, and I think there were as many pictures taken of us during the ride as we took of the temples. Upon dismounting, Sophia and Cooper both fed Sambo a pineapple, which he quickly gobbled up, and we made our way inside the Bayon temple for a closer look. 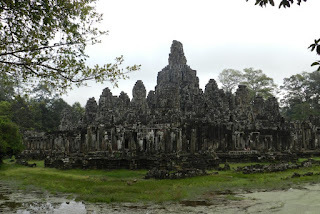 The Bayon Temple, like most others we saw, is covered with reliefs depicting various Khmer legends and epic battles. But the prominent feature of the temple is the multitude of large faces that adorn each of the towers. What was most amazing was the consistency of each face and how much they looked alike. Just remarkable considering how they must have been made nearly a thousand years ago. 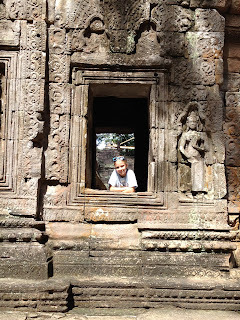 After exploring the Bayon Temple, we moved on to a neighboring temple called Phimeanakas. This temple was built about 200 years earlier than the Bayon Temple and resembled a Mayan pyramid. Sophia, Cooper and I climbed the steep steps to the top, which was much easier than coming back down. Once on top, however, we were greeted by a Cambodian woman who smiled at the kids, offered them incense, and said a small prayer for our family...I think. So I've got that going for me...which is nice. 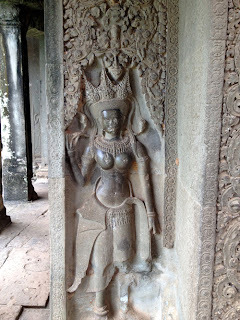 After Phimeanakas, we visited several other spots within Angkor Thom, including the Terrace of the Leper King and the Terrace of the Elephants. The former is believed to be a temple for the dead, and was named after King Yasovarman who was believed to be a Leper. The Terrace of the Elephants is a large multi-tiered area where the King would observe his army, consisting of many elephants. 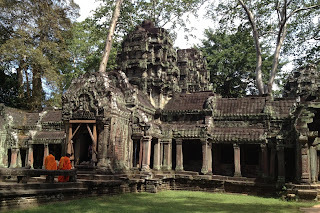 It is also an area where he would greet his victorious warriors as they returned to Angkor Thom through the main gates. Cooper called this an "ancient lego"
At this point in the day, the hot sun was wearing on all of us, and we were eager to head to lunch. 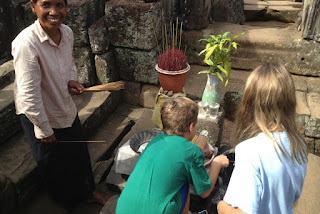 Savonn recommended a local restaurant run by his friend, called The Angkor Flower. Upon pulling into the parking lot, the staff (who had been relaxing in hammocks outside) greeted us with a smile and welcomed us inside. We were the first guests for lunch, but were soon joined by another 40 or so temple visitors. I ordered Amok Fish (a local favorite), Jennifer had a delicious plate of fried noodles, and the kids ate some fried stuff - the most western of what was available on the menu. We are working on their palates, but it is a slow and torturous process. We invited Savonn to join us for lunch, which by his reaction, was not expected. He was happy to eat with us and we had a very interesting conversation about his family, his life and his pride in his country and people. 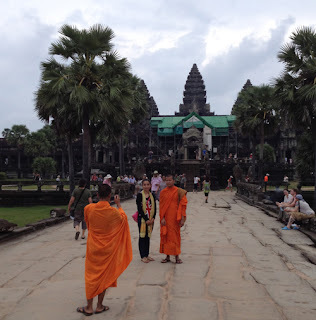 A highlight for me was the discussion we had about Angkor Beer, Cambodia Beer and Black Panther Beer. The latter he described as "the kind of beer you take when your friend tells you he killed a snake and invites you to dinner". We loved the casual conversation and opportunity to better understand life outside the usual tourist experience. Our pictures, along with our afternoon in the village and conversations with Savonn are clearly our favorite souvenirs from this trip. After lunch, we were re-energized and managed two more temple visits before heading back to Journey's Within. 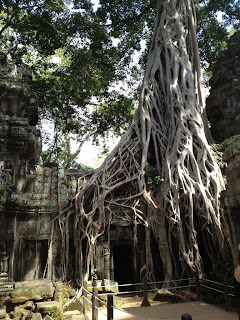 The first was Ta Prohm, which is one of the most well known due to its role in some of the filming of Tomb Raider. We saw no Lara Croft, but Sophia and Cooper filled in with plenty of climbing and jumping among the rubble. 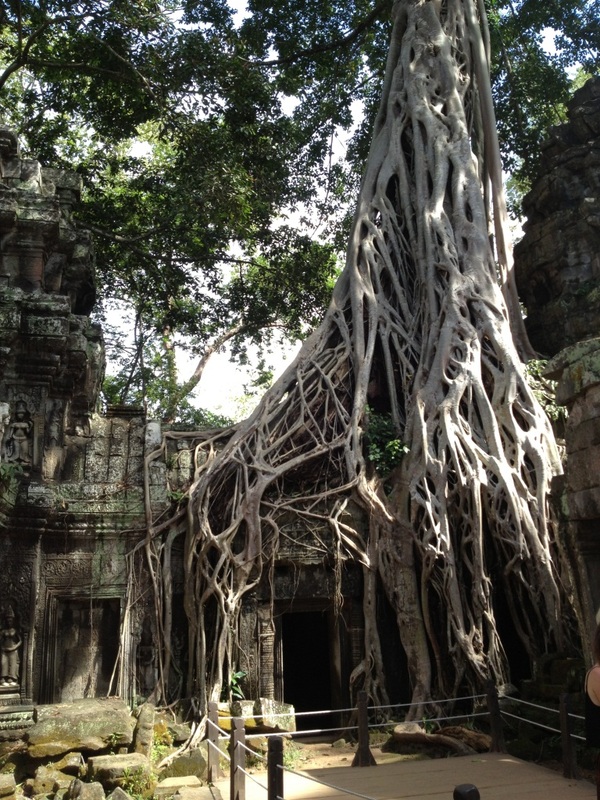 Ta Prohm was built in the late 12th and early 13th centuries as a Buddhist monastery and university. It was recognized by UNESCO as a World Heritage site in 1992, and has become one of the most famous and visited temples in Siem Reap due to the trees growing in, around, and literally on the temple walls. 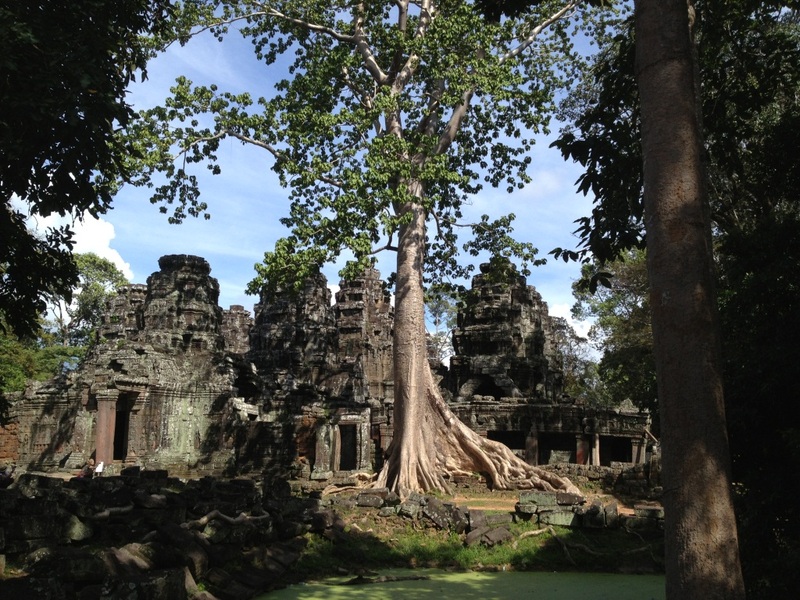 As a result of these trees, the temple has received limited restoration, as removing the trees will cause the temple to crumble. 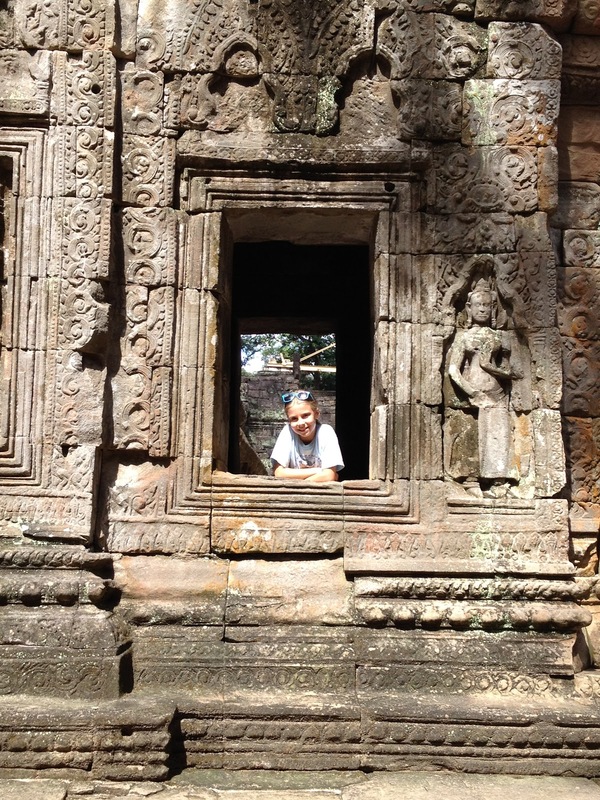 After exploring Ta Prohm, we were exhausted, but Sophia was eager to visit "just one more" before heading back to the pool, Tuna, and a cold Angkor Beer. This last temple of the day was Banteay Srei. 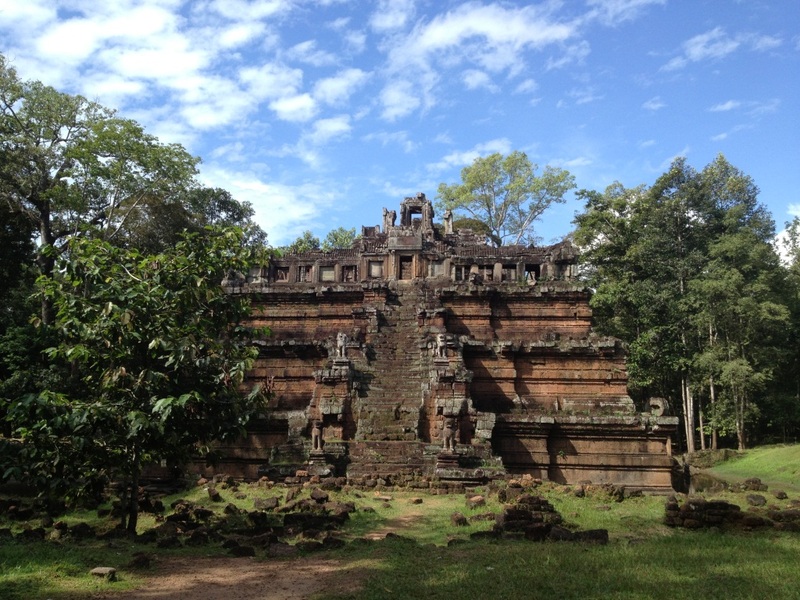 Built in the 10th century, Banteay Srei was considerably smaller than the other temples we visited, but was just as beautiful, and decorated with reliefs and carvings on almost every stone wall. Evidence of our exhaustion, we took far less photos of what many consider the "jewel of Khmer", than we did at the other temples, but hopefully these give you a taste of what we experience there. At this point, we stumbled to the cool air, ice-cold wet towels, and bottles of near freezing water that awaited us at the car. Luckily, the ride home was pretty quick, and we relaxed the remainder of the afternoon by the pool. 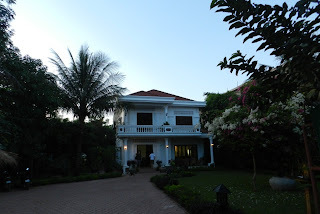 Later that evening, we texted Moeng (our friendly local tuk tuk driver) to pick us up for dinner, and we headed to a small, out of the way Italian restaurant, L'Oasi, where we enjoyed one final dinner in Siem Reap. The food was great, but the highlight of the evening was eavesdropping on a pair of American and French archaeologists having an impassioned discussion about the best way to approach restoration of a nearby temple. It was fascinating to watch them rifle through pages of photos, diagrams and blueprints as they discussed differing points of view and techniques. It sure made my job seem awfully boring! After a short ride to town, we made arrangements for Moeng to pick us up one last time, and we headed to the Old Market for some final shopping. We didn't last real long, but found some great souvenirs among the vendors at the market before heading back to Journeys Within for one last night before a visit to Tonle Sap, the floating village, and our final temple visit at Phnom Krom. 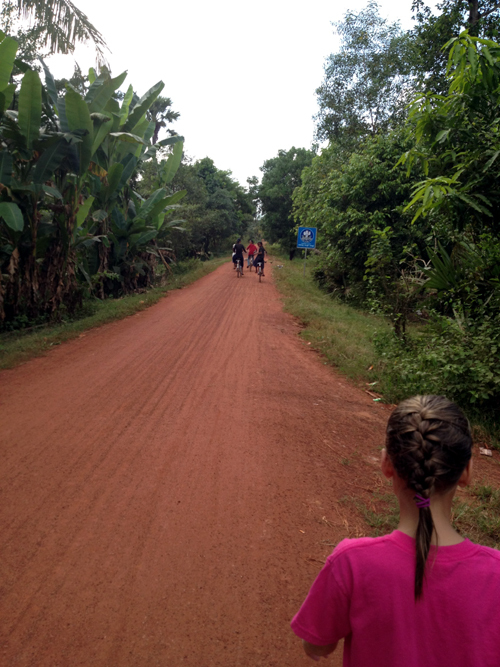 Stay tuned for day four....our final day in Cambodia. Day two started bright and early with a 7:15am breakfast in the hotel restaurant. Because of the small size of Journeys Within (JW), guests are asked to select their menu items the night before, so the staff can shop appropriately. Speaking of the staff, at breakfast we were introduced to one of our favorite JW staff members, a young woman named Rath, who waited on guests in the small restaurant and at the adjoining pool. She was sweet-natured, friendly, and took tremendous pride in providing great service and getting to know us and our kids. We truly enjoyed our interactions with her during the trip, and I admit I shed a tear saying goodbye. After some pancakes (Cooper), omelet (me) and banana and chocolate crepes (Jason and Sophia), we headed to the lobby to meet our guide and driver for our first tour - Angkor Wat. I committed my first faux pas (I *hope* my only actually) by wearing shorts. I had researched the customs, but I had read that "short shorts" weren't allowed, so brought shorts that came right to my knees. Come to find out, women have to cover their knees and shoulders (had that covered...literally!). I was not a happy camper at first, until I realized I just couldn't go to the top level of the temple. With the searing heat, I would gladly exchange climbing an additional level for the comfort of shorts (*relative* comfort). 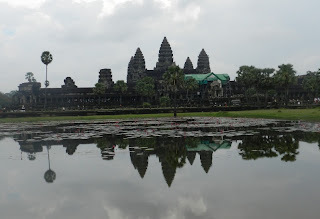 So we took off for Angkor Wat with yet another of the friendly JW staff - this time, our temple guide, Sovann. Sovann, we quickly learned, has two children of his own, but also has FOUR adopted orphans and a baby on the way, all aged 12 and under. He works as hard as he can to pay for special schooling so all of his children learn English and computers. He talked more than once about how much he wishes he could buy a second-hand computer for his family so they could practice outside of school, but something like that is far out of reach. The schooling alone is a huge stretch, financially. While he was talking, I think I felt physical pangs of guilt thinking about all the laptops in our family. I find it difficult on these vacations (not only witnessing the poverty) but realizing that I might never return. Not because I don't want to, but I am a realist. Cambodia is probably a 24 hour flight from the United States, and I doubt I will ever live in Southeast Asia again. It is a very empty feeling to say goodbye to these people that you meet for such a short time but feel very fond of. The complex is enormous! It's completely surrounded by a moat, followed by a sandstone wall with multiple entrances (one for the king and queen, two for the nobility, and two more for the unwashed masses). Once inside this exterior wall, the temple itself is still a few hundred yards away! Sovann led us around, providing just enough information to keep us interested but not overwhelmed, and took us to the best picture-taking spots. Cooper and Sophia had fun climbing the rocks and narrow steps throughout the complex. 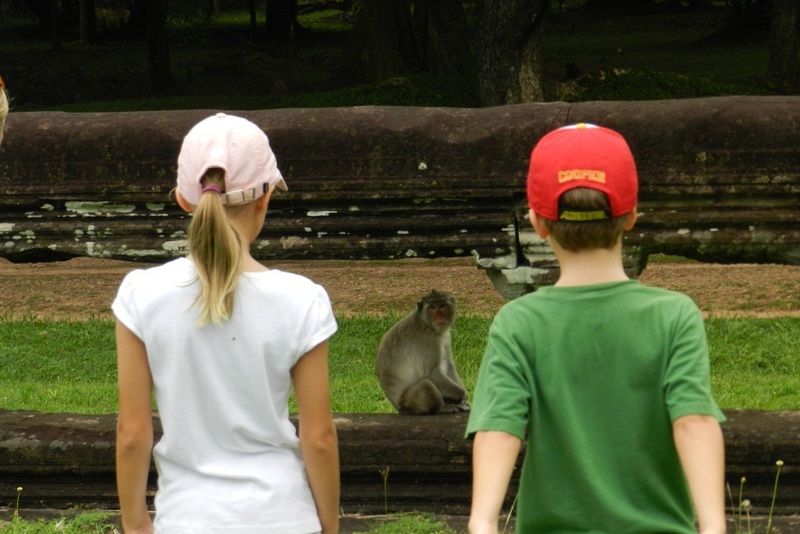 Along the way, we met some (umm...randy) monkeys and passed by many Buddhist monks. It was amazing to think of how this massive structure was engineered and built so long ago, and just how long it has survived, especially with major damage in the mid 1970s from a war (more on that later). I think we were all quite awestruck. Seeing the kids in the pictures really put the size in perspective! 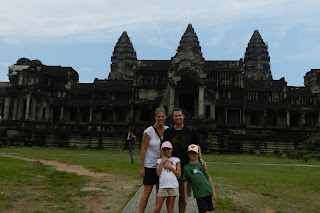 Our next activity was just down the road from Angkor Wat. 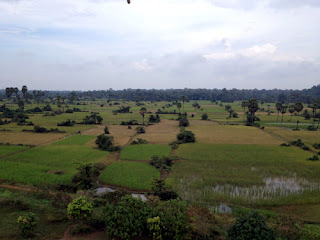 We ascended into the sky on a tethered hot-air balloon to see the temples from above. This was such a great idea as it really gave you a perspective on the land - basically just neverending rice paddies and people working them. And cows. Cows everywhere. While everyone was trying to view Angkor Wat, I stayed on the opposite side of the balloon from everyone else - I was a little creeped out by the slight tipping to one side by everyone's weight! After the balloon, we were ready for lunch and a break. 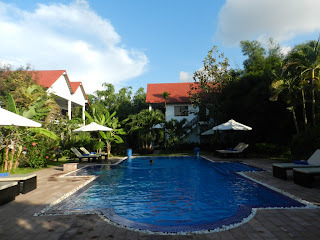 Our driver dropped us back at the hotel for a short rest and we ate at the pool and went for a quick swim. Cooper was soooo happy to have his usual chicken fingers and french fries, and I was delighted with my spring rolls. I am pretty sure I could live on spring rolls. (and vegetable ones at that....shocking if you know me!) The fried yellow noodle with chicken was also excellent. 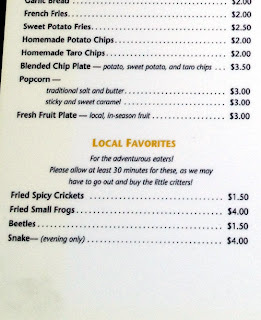 Check out the pool menu - notably the local favorites section! 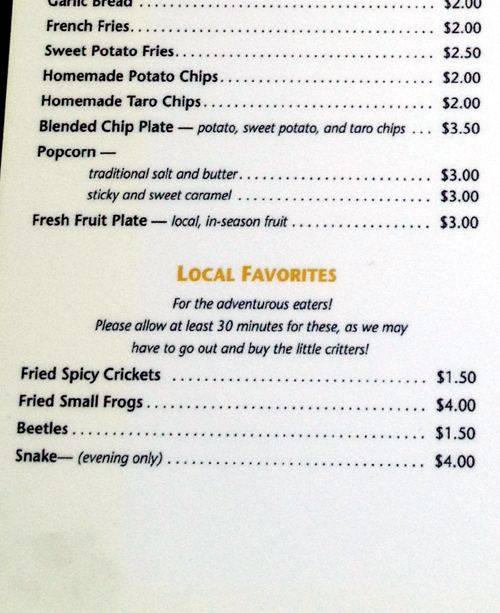 I was really bummed that snake was only available in the evening, because I was REALLY craving it at lunch. We will be talking about Sovann a lot more in the next posts, but please visit his website or email him at sovannkoth@yahoo.com if you are interested in his services. We highly recommend him! At 2:00pm our driver was back, but with a new guide, Sothy ("So-tee"). His job was to take us to his village to meet some of his family and see how they live. This was easily the most emotional part of the trip. After about 15 minutes on a regular road, we turned onto a dirt road that was close to undrivable due to huge holes and bumps left behind when the area inevitably floods every wet season. At one point we passed a man on a motorbike with dead pigs as cargo. What was to come was starting to become quite clear. And I admittedly started to get anxious. See, I cannot hold in emotion. Call it a weakness, call it a strength, but I call it annoying. Thank goodness for sunglasses. The most profound moment of the entire trip came as we drove down this dirt road. Sothy, in a matter-of-fact way, told us that when he was younger, not many kids attended school in this village. Not because they didn't have a school or couldn't find teachers - rather, because all of the previous teachers had been tracked down and murdered by the Khmer Rouge regime. What he is referring to took place mainly between 1976 and 1979 (the genocide part, the violence and fighting lasted many, many more years), when a communist party called the Khmer Rouge, led by Pol Pot, drove everyone out of the cities and into country labor camps to work the land basically as slaves. They executed almost all teachers (95%) and doctors (75%), in fact, anyone with an education, links to law enforcement, the previous government, disabled people, and minorities. Many times the entire family would be killed. The only way to survive was to pretend to be a farmer, but no matter who you were your chances were slim. Children were torn from their parents, trained as soldiers, and took part in torture and execution. By the end of the reign, approximately 2 million Cambodians died - about half by execution and the rest by starvation and disease. Did I mention this was in the 70s? While I was happily playing with my dolls, a quarter of the population of an entire country was being wiped out by monsters. The world at first mostly denied it was happening, then when it could no longer be denied, largely ignored it. As we ambled along the road, we got a good look at the most common type of housing in Cambodia - open air wood structures with thatched roofs. People sleep on wood slats or in hammocks. There is no electricity, no plumbing, and just well water (rarely filtered). 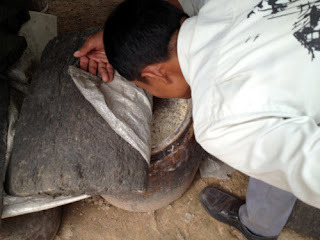 Rice farming is the primary business - rice is grown, it is processed (Sothy owns the only machine in the village and allows others to use it), made into rice wine (see pic), rice noodles, rice milk - you name it. The people literally work all day at whatever they can. Livestock are everywhere and live under the wood structures (i.e. the bottom floor of the home). They still use oxcarts to farm the land. It is almost the same way they have been living for hundreds of years, if not a thousand. With the exception of a few cars and motorbikes in the village, there are few technological advances reminiscent of the modern world. The one connection we all seem to have these days though is a mobile phone. Phone cards are very inexpensive there, so almost everyone has one. TVs are not common, but some people have one hooked up to a battery generator. During our walk through the village, we met Sothy's mom, grandmother, some sisters and a baby nephew. As we passed by a very festive wedding reception (lots of beer cans and lots of dancing - we are not that different in some ways! ), we also met his grandfather (or uncle, I'm not sure since he has soooo many relatives!) who was wearing a police uniform. At first, we didn't notice, but were informed by Sothy that this man had both of his legs blown off by landmines. I say this so bluntly, because that's precisely how Sothy communicated it to us. 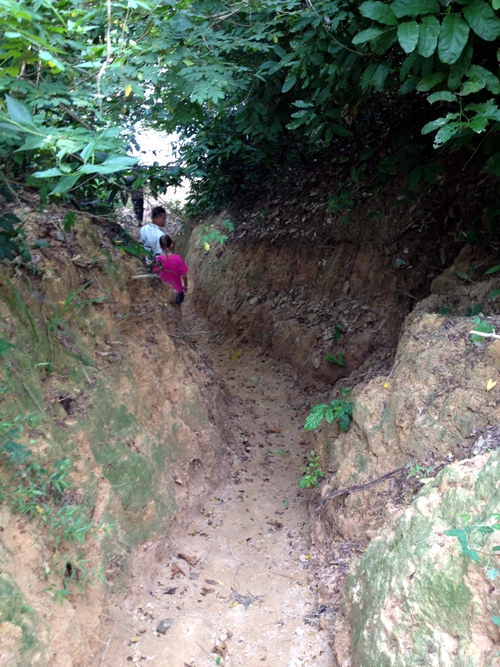 The Khmer Rouge planted thousands of these mines, without drawing maps, to keep the people from running away. They are still being uncovered by unfortunate Cambodians. While walking through the reception, an older lady approached us, smiled, and gave Sophia a little kiss on the cheek. This was the second time this had happened since we arrived. 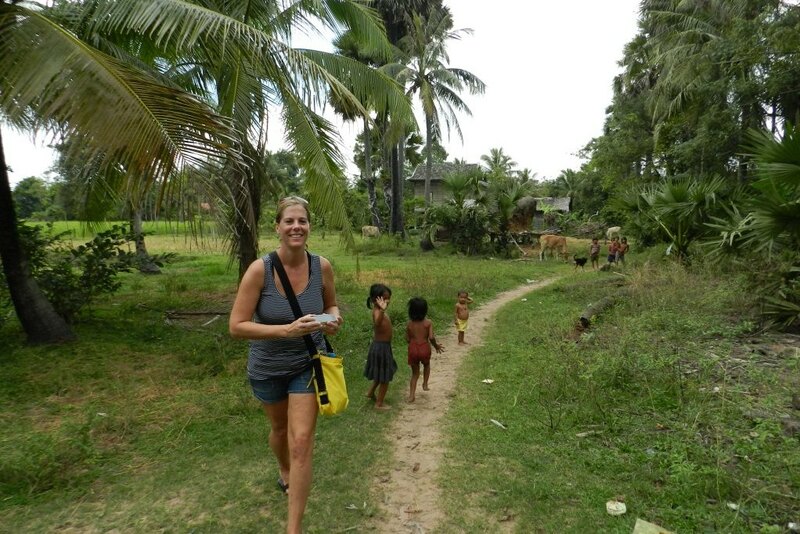 It became apparent that few people in Cambodia had ever seen a blond girl! I was happy that Sophia took it in stride, because the lady had the biggest smile on her face. 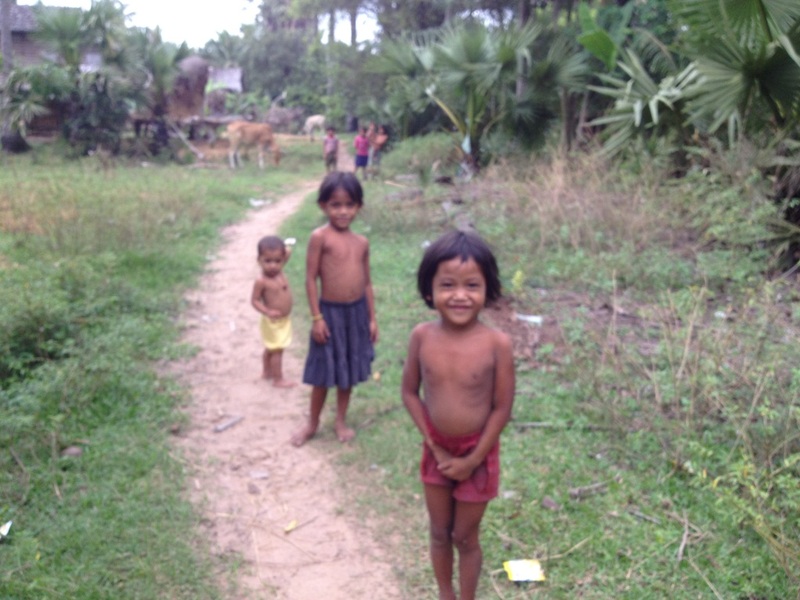 Throughout the village, there were young children playing or working around their homes. Many of them stopped to watch us walk by or ran up to say hello, wave and practice the little English they knew. They were such adorable children and were so interested to see what we were doing in their village. Eventually, I asked to take a picture of a few young sisters who I had seen more than once. They smiled for me and then were excited to see it on the screen (not sure they had ever seen that). I just love this picture Jason took of me after I showed it to them. 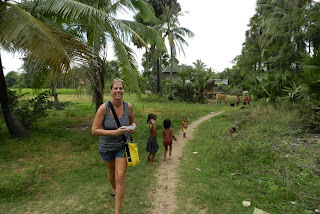 After a full loop through the village, and a glimpse into just how primitive and difficult life is for so many, we made our way back toward Journeys Within. 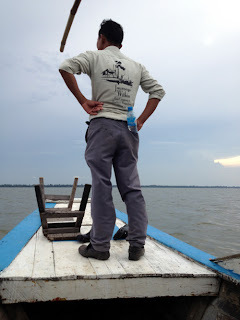 Sothy led us along an overgrown, unmarked trail to the manmade lake that bordered the village and we took a small boat to the other side, where our driver was waiting for us. When we got back to the hotel, I just looked at Jason and said, "I don't even know what to say." I still don't really know what to say. If you'd like to comment, please do. We love to hear from our readers. If you are looking for a new book to read, please consider "First They Killed My Father" by Loung Ung. The link is to Amazon.com. It helps to understand the rule of the Khmer Rouge, and it is a book you will read in 1-2 days. I don't even know where to begin with this round of posts. This trip was the most eye-opening, humbling experience of my life. It was fun, heartwarming and heartbreaking all rolled into one, which is a strange mix of emotions to feel over the course of only three days. 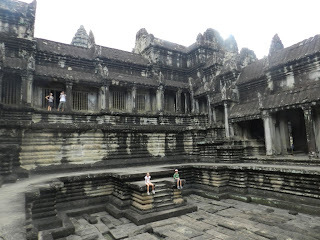 I felt elated (meeting the wonderful people), exhausted (climbing temples) and at times on the edge of a nervous breakdown (witnessing the living conditions). I hope I can write in a way that will paint a vivid picture of this interesting and tragic country. 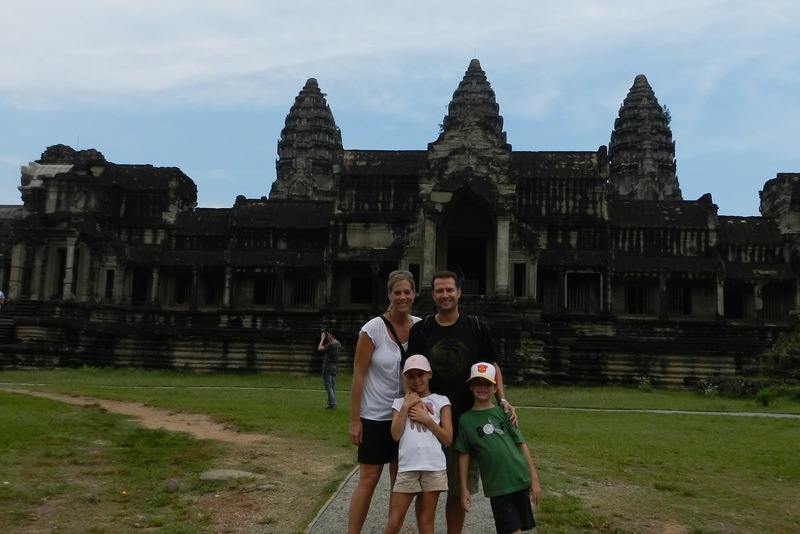 Travel from Singapore to Siem Reap was completely uneventful. It is only a 2-hr flight and we quickly got through immigration since we had electronic visas. I highly recommend applying on their website to avoid standing in a line upon arrival. A friendly driver (who spoke no English) held the usual sign with our name on it, loaded up our baggage and we were on our way to the hotel. Along the short route we saw many large hotels and the usual spattering of stores, bodega-type stands and small restaurants catering to the locals. 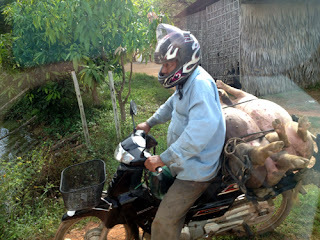 And of course, lots of motorbikes and tuk tuks - many overflowing with 3 or 4 passengers sharing a single bike seat. Very few (including young children) wearing helmets. After a 15-minute ride, we pulled into a very non-descript driveway to what would be our home for the weekend. The lobby building looked like a beautiful British Colonial house. Our first greeting came from the resident dog, Tuna. Cooper and Sophia, to no one's surprise, ran right to the pup and fell instantly in love. Alex, an intern manager and recent college graduate from Chicago, came out (barefoot and with a very casual way about him) and welcomed us to the Journeys Within Boutique Hotel. The American owners, Brandon and Andrea, were away so he was in charge. We sat down at a table in the small lobby, were served some fresh pineapple juice and got the lay of the land. 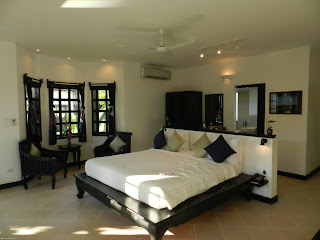 Once we were shown to our room, we were able to relax and really survey our surroundings. 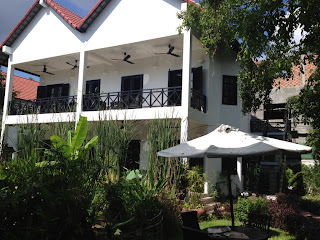 The boutique hotel has only ten rooms, and we occupied two of them (adjoining). The kids' room had two double beds, ours had a king and we both had large bathrooms with awesome showers. A balcony ran across the length of both and overlooked the pool. The rooms were spotless and very tastefully decorated - overall, just very comfortable. Complimentary laptops were in each room, as well as air conditioning, ceiling fans and TVs on the wall. Bottled water and sodas were available at no charge from the mini-fridge (unlimited). Wifi was easily accessed anywhere on the grounds. Since I have SO much to write, even after dividing up the trip into multiple posts, I will let the pictures speak for themselves. Journeys Within truly was our little piece of paradise that, after hours of sightseeing in the blisteringly hot climate, we were relieved to return to every day. I also wanted to mention the school that Journeys Within runs. They owners of the hotel truly have given back to the community with the creation of several community programs including two schools, one in Cambodia and one in Laos. No matter how eager students are, poor facilities and resources prevent the children of Cambodia from receiving a quality education. Journeys Within Our Community (JWOC) gives over 700 children a chance to learn English and have a chance at a higher education. Those that do not continue still learn valuable vocations that will help them lead more productive lives. Due to the school's schedule and our crazy itinerary, we did not get a chance to visit the children at JWOC, but we did exchange waves and smiles a couple times a day with many of the students, who were so excited to see our kids! Since we arrived late afternoon, we let Sophia and Cooper go swimming while we enjoyed a couple of beers. As with everywhere we visit, we chose the local beer, Angkor in this instance. Over the next few days, we would get to know Angkor very well! After a couple of hours, and now fully refreshed, we cleaned up and headed by tuk tuk (hotel offers free rides nightly) into the town of Siem Reap for dinner. The main tourist area of Siem Reap is Pub Street. In a country where 80% of the population has no electricity, Pub Street clearly stands out. Brightly lit shop signs and flashing neon are abundant, as are unique local shops and restaurants, all pretty well blocked off from traffic. 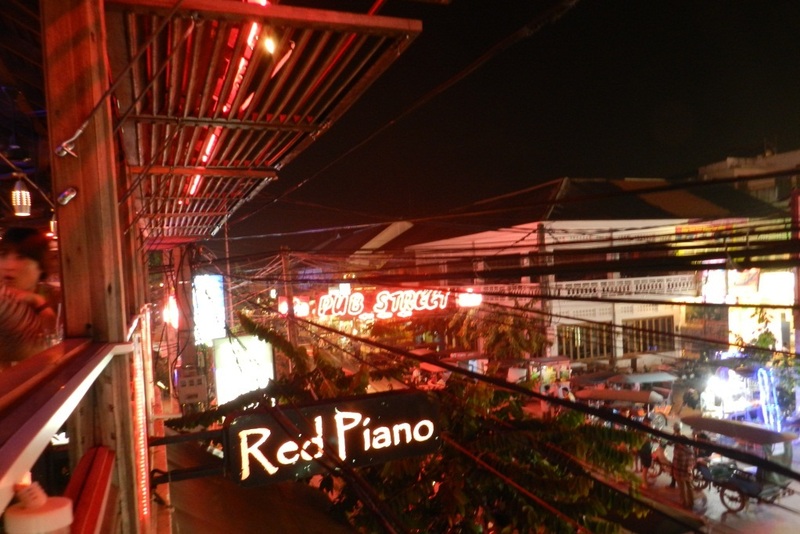 There are restaurants with all kinds of cuisine, western included, and we chose a two-story restaurtant called the Red Piano. At the time I did not know this, but the Red Piano is now known as the hangout of Angelina Jolie when she was in Siem Reap filming Tomb Raider. 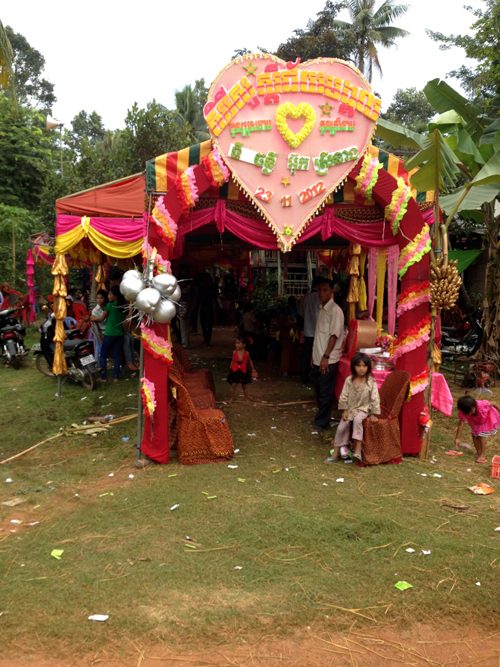 As has been our experience in all Southeast Asian countries, the service here was excellent. We wanted to sit overlooking Pub Street, but all tables along the balcony edge were taken so we settled on an inside table. Moments later, as soon as a couple left a table on the railing, the staff motioned for us to move over and enjoy the view. We also had two servers at all times ready and waiting to help us with our needs. When the bill came we were shocked. Two beers, two glasses of wine and four adult-sized entrees totaled $27 USD. (The US dollar is used as the main currency, there is also the Cambodian Riel) The same dinner in Singapore would have cost at least $150. We had wanted to shop at the night market after dinner, but a sleepy Cooper thwarted our plans! His falling asleep in public is starting to become quite a theme! It almost deserves its own blog. 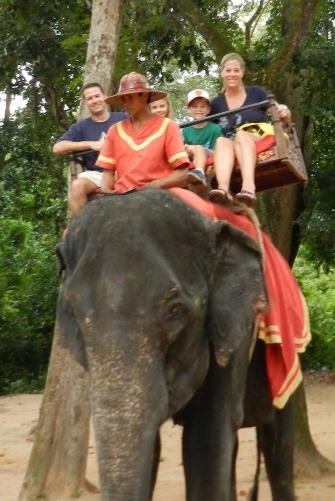 First he fell asleep at the table, then on Jason's shoulder and finally in the tuk tuk back to the hotel. 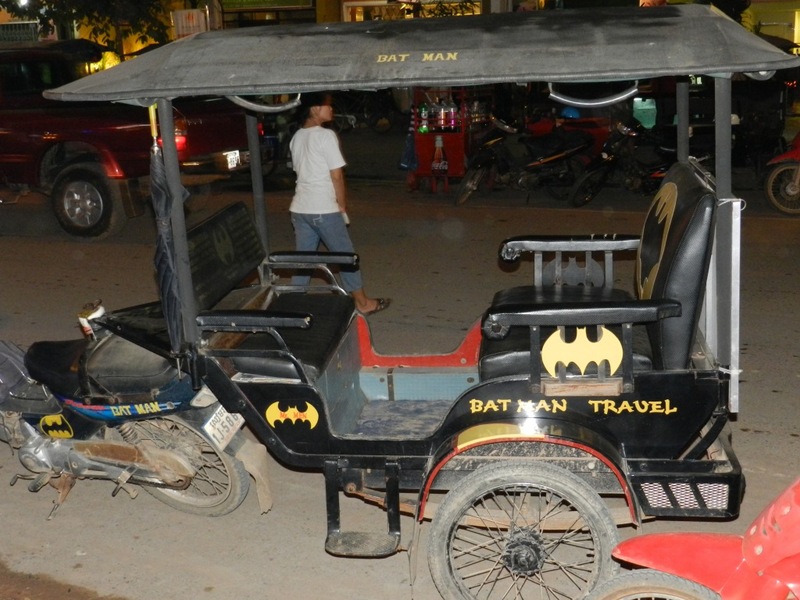 Finally, I wanted to comment on our tuk tuk driver. His name was Moang Moal (Mo for short) and he was very friendly, and easy to spot with his pink helmet! We got his card and ended up calling him every evening to take us out and bring us home. If anyone runs across this blog and is heading to Siem Reap, please call/text him at (+855) 97 60 29 493 or email him at moeng.moal@gmail.com! Next time I'll get to some of the good stuff - the temples!